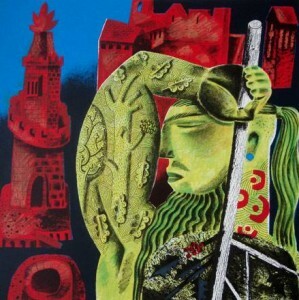 For the past two years Clive Hicks-Jenkins has been making a series of fourteen screen prints based on the mystical medieval poem, 'Sir Gawain and the Green Knight', using Simon Armitage’s 2007 translation published by Faber & Faber. The work has been a collaboration with Daniel Bugg, whose Penfold Press has produced and published the editions of prints. January sees the second and concluding Gawain-themed exhibition at Martin Tinney Gallery, with all fourteen prints on show, accompanied by art historian James Russell’s insightful observations on the images. The studies and paintings made in the process of creating the prints will be included in the exhibition. When a gallery is completely empty, alarm bells may ring. Maybe something is wrong, or perhaps the exhibition isn’t as popular as you had expected. But to be frank, the silence made these images of Gawain that much more memorable. The first print on display is jovial in tone, vibrant reds and greens that suggest wonderful Christmas and Celtic connections, given the Arthurian setting. Three riders coming to Camelot set the scene. But as my experience went on to show, this is the only truly ‘jolly’ print. The fourteen included, starting on the left wall and circling round to the other, tell a powerful story. Moving off to my right, we are introduced to the crux of the story: the Green Knight. Here he arrives at Camelot as well, but now the mood becomes more sombre. The Knight is depicted in non-naturalistic terms, with tattoos on his tree-trunk arms and a curious hairstyle. The third print speaks volumes about the character differences between Gawain and the Green Knight. Gawain, having picked up the axe to kill the Knight, stands firm and resolute, eyes focused. The interpretative text by James Russell describes him being scared, and I agree. His eyes, while staring ahead, are filled with fear. The Knight, meanwhile, does not seem at all disturbed. Which isn’t surprising, considering the next image has him calmly holding his own severed head as though it is nothing new at all. The supernatural and magical is afoot, and with the eyes on the horse behind him staring straight at the audience, I continue to be disturbed and fascinated with this depiction of the poem. Working my way through the next couple of images, I watch as Gawain, a year later, travels outside Camelot to find where the Green Knight dwells and to defeat him finally. The fifth image and the second make a striking pairing. In the order shown, the pair are facing away from each other, as though they are two halves of a coin. But while the Green Knight is stoic and powerful, Gawain looks terrified out of his wits. Hicks-Jenkins, throughout most of the pieces, depicts Gawain as a frightened, disturbed young man haunted by the Knight. But from Gawain’s early tribulations with a serpent – which has a striking resemblance to the dragon fought by St George – (and which he calmly disposes), the audience sees Gawain become fully grown. This maturity is shown in the seventh print, with all its echoes to the first. But while the first was jovial, in this image, Gawain shows nothing but severe strength. The same kind of power shown by the Green Knight? Perhaps not, but it is close. The prints on the second of the three walls depict a side-story of Gawain coming upon the Fair Castle, the home of Lord Bertilak, and the temptation of his wife. They show the characters’ being challenged emotionally and physically. As I was mulling over the test of Bertilak which is revealed by the Green Knight, it occurred to me how effective Hicks-Jenkins’ use of supernatural elements brings a focus to the mental aspects of Gawain’s challenge. The last image, cooped up in the corner, shows the finality of the story. Gawain discards his armour, but like the metal protecting him, his skin and mind have been forever scarred. He comes home to Camelot a hero, but it is clear that he certainly does not feel like one. 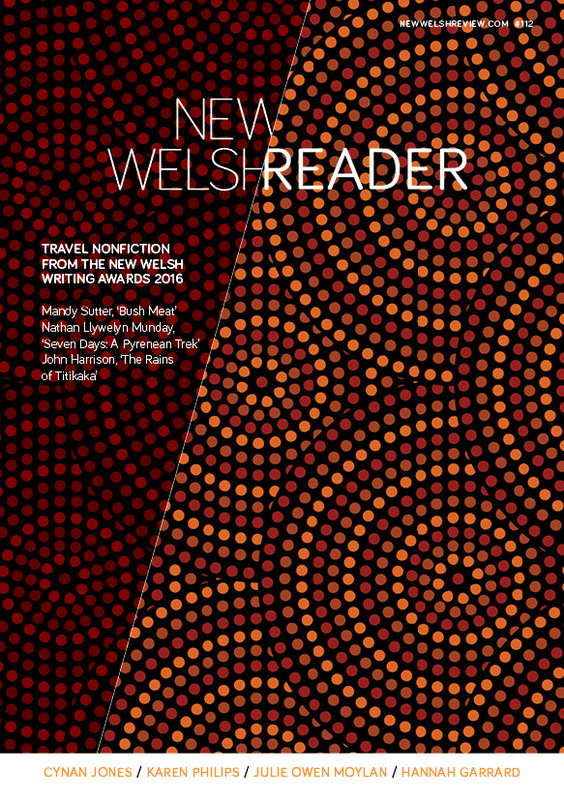 This exhibition runs at Martin Tinney Gallery, Cardiff, until 27 January. Clive Hicks-Jenkins’ work is also displayed at Oriel Tegfryn, Menai Bridge.